An expectant hush falls across the battlefield as the enormous, ancient serpent swoops out of the clouds. With a single breath, the dragon devastates its enemies and strikes terror into the hearts of all who behold it. 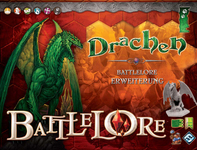 In the BattleLore: Dragons expansion for the BattleLore fantasy battles board game, the epic battle continues with completely new and terrifying combatants: Dragons. BattleLore: Dragons features three new creature plastic miniatures: the Ice Drake, the Fire Dragon, and the Wood Wyvern, each with accompanying summary cards, and tokens. BattleLore: Dragons also includes a rulebook with four new adventures featuring the Dragons. Also included in this expansion are a card for the Troll figure (from the BattleLore: For Troll and Country expansion) as well as a Troll Bridge token.